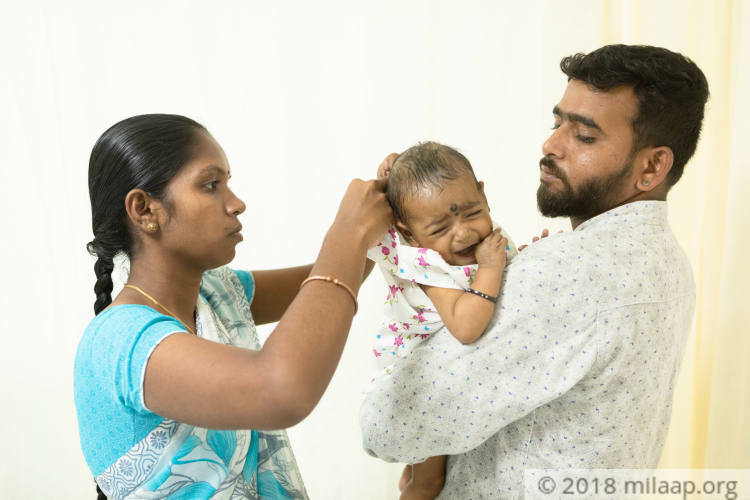 When Radhika was just 3-months-old, her parents Srinivas and Swapna were told that she would not live beyond a few months. Refusing to give up, they got a second opinion from another hospital. While the baby's liver is completely damaged, she can be saved through a liver transplant. Her parents are now desperately trying to arrange for a life-saving transplant. 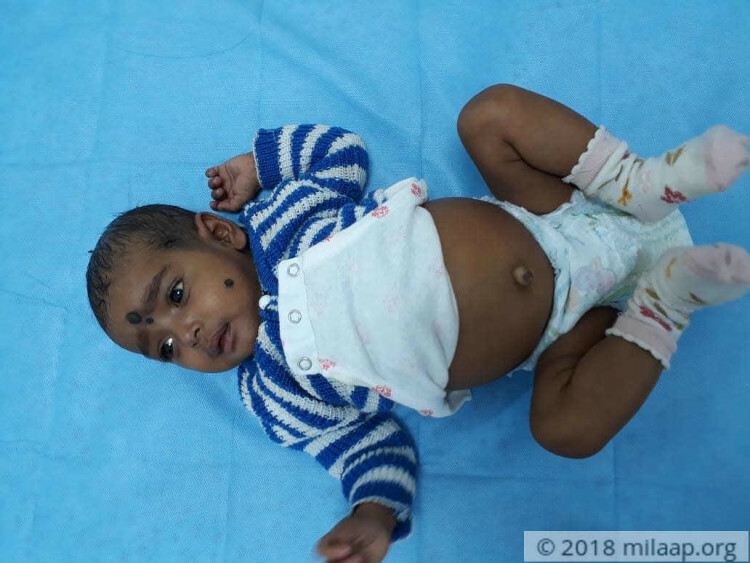 Baby Radhika was born with Biliary Atresia. It is a condition where her bile ducts are blocked. The bile accumulates, slowly, painfully damaging the liver. 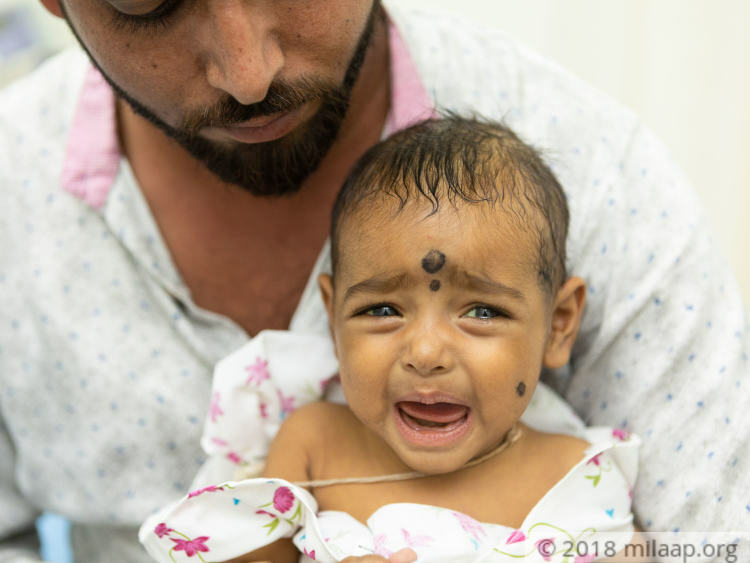 Baby Radhika's liver was damaged completely in three months. She needs a new liver at the earliest to have a chance to recover. To her parents, news of her liver damage came as a shock. After the birth of their son, Srinivas and Swapna really hoped to have a daughter. But the joy of Radhika's birth was marked by constant anxiety about her health. A liver transplant promised to end all that. They are both ready to donate a part of their liver to save her. Only the exorbitant cost of the transplant stands in the way. Both Srinivas is a driver and Swapna works as a helper in a shop in Hyderabad. They both dreamed that they would together earn enough to keep their children happy. Unfortunately, they simply don't have enough to even save their little girl's life. 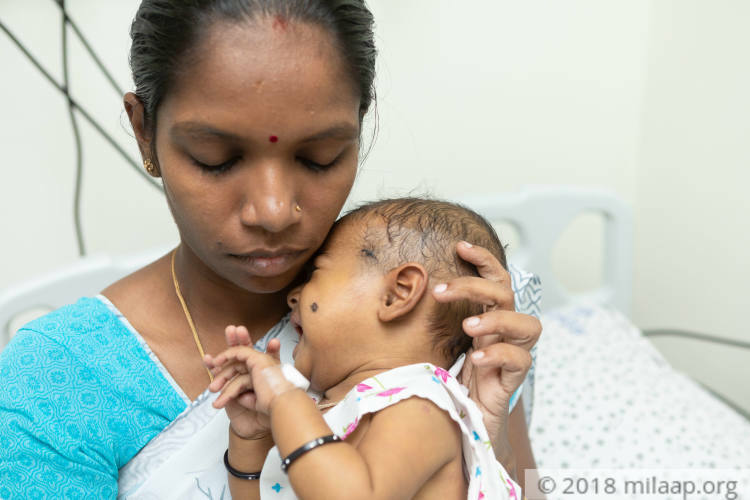 They have borrowed heavily for Baby Radhika's check-ups and medicines. They have no resources left. Your contribution will help save this baby's life. 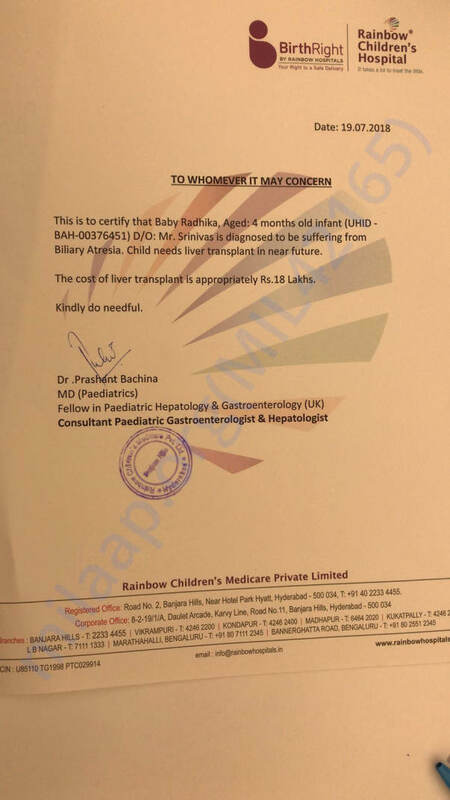 Click here to contribute and save Baby Radhika. 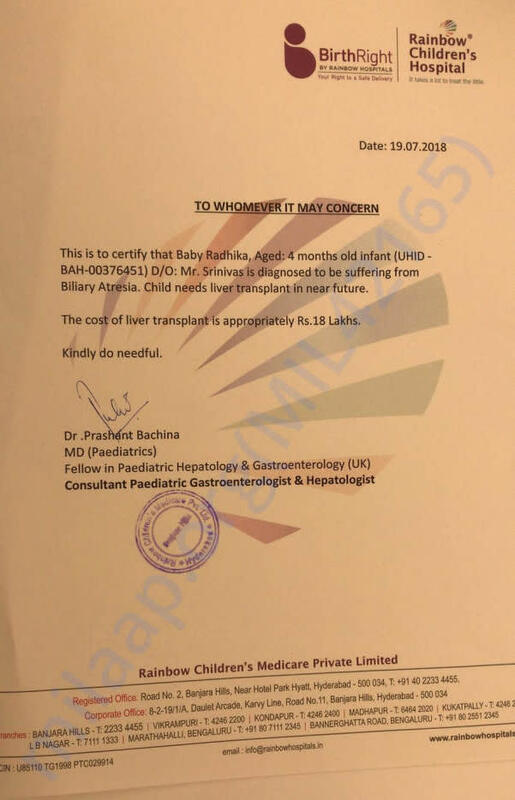 Radhika has successfully undergone her liver transplant and the mother was the donor. She is responding well to the treatment and is recovering and will get discharged soon. Thank you for all the love and support you have shown towards Radhika. Radhika is currently at the hospital, she is responding well to the treatment. 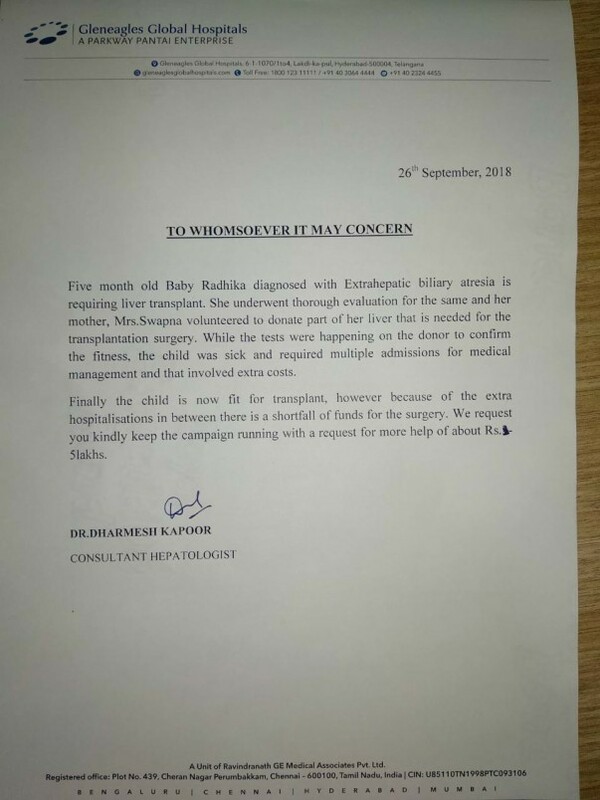 However, while she and her mother (who is a potential donor) were undergoing the evaluation for the transplant, Radhika's health got deteriorated and required multiple admissions. Now, she is fine and fit for the transplant, however, the family requires another 5 lakhs to continue the treatment. There is shortfall of funds as the funds raised earlier have been utilized to settle down the hospital expenses and for her medical care. Hence, we are restarting the campaign to help Radhika undergo the transplant at the earliest. Please find the attachment of the letter from the hospital. Thank you once again for the support. Please do share the campaign with friends and family and lets support baby Radhika. Radhika has undergone the tests for the transplant and now her mother is undergoing the tests for donor workup. We will keep you posted on further developments. Prayers for the little Radhika’s complete recovery and good health !